Rick and Morty #46 Review – AiPT! A great issue that tackles Westworld in a sci-fi parody well worth reading. When it comes to comedy, almost anything goes. Thanks to parody law, Rick and Morty could go to a Westworld-style amusement park and wreak havoc. Oh wait, they do just that in this week’s main story in Rick and Morty #46! Also, Carlos Pacheco delivers a backup story involving the exotic Penp alien race. Rick and Morty go to a theme park filled with robots that look like for real people and exist to fulfill all your carnal and/or lusty needs. Like that show, you know? With the robot theme park. But with Rick and Morty. You get it, right? 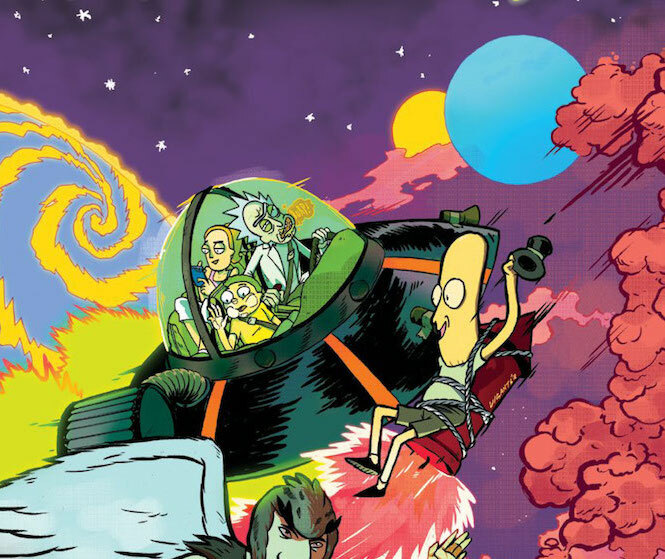 It may feel like ages since Rick and Morty had a new episode, but did you know Oni Press is publishing some of the funniest Rick and Morty stories in comic book form? Thanks to Kyle Starks and Marc Ellerby, this series has been fantastic for quite a while. Count this issue as yet another installment in high-quality comedy and sci-fi ideas. Starks continues to do great work on this series and this time explores a different alternate Rick invention to explore in the form of an amusement park. As we learn early on, the same Rick who made the Jerry day-care also made a Westworld-style amusement park for Ricks to cut loose. This same park comes complete with a variety of worlds to explore, a tracker reminding folks how long it has been since the last robot uprising and a special place to store Mortys. The story kicks off due to Rick being sick of Morty and needing some R&R. As the story carries on there’s plenty of gory humor, Rick freaking out Morty, and some clever alternate reality Mortys. There’s also a funny PUBG inside joke if you look close enough. Ellerby continues to show why he’s one of the best and his style seems to improve with every issue. His art does not hold back with the bloody smears and the rendering of the hamburger Morty is hilarious. Not an easy thing to pull off. Pacheco writes a good backup, misleading the reader just enough so that the twist in the joke works well. It’s a joke that’s as dirty as they come and it’s made all the more hilarious due to the once beautiful Penp creatures now taking on a horrific visage thanks to Morty. CJ Cannon draws this story, another Rick and Morty regular artist, and Cannon’s art sells the gangster pimp look for the alien boss. Is it bad I wanted the Westworld jokes to never end? One thing that seemed to be lacking in this opening story is other Ricks, or at least other folks enjoying the park. As it stands it’s a bit of a limited look at it when it could have been so much more. As with most comedy I suspect not everyone is going to laugh out loud at all the humor. For what it’s worth though, there are enough jokes in this issue to satisfy most. A great issue that tackles Westworld in a sci-fi parody well worth reading. The backup also contains a rather sick twist that should make anyone with a third grader’s sense of humor laugh out loud.